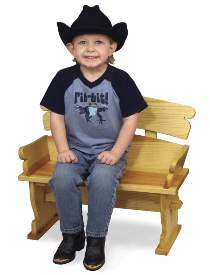 Build this sturdy children’s bench from 3/4" pine. Angled back and armrests provide a comfortable place to sit. Designed for children 1-1/2 to 4 years old. Patterns drawn FULL SIZE. Measures 21"H x 23-1/2"W x 11-1/2"D.